The main focus in this lesson is on this chord shape. [ It is possible to play the bottom string as well making it G with a D bass ]. The tune I'm using to demostrate this chord is ' Prodigal Son ' but you can use this shape in a lot of different ways as the second chord in a 12 bar sequence. Prodigal Son is an old delta blues song by Robert Wilkins ( covered by the Rolling Stones ). Like a lot of early blues tunes this is not a 12 bar. 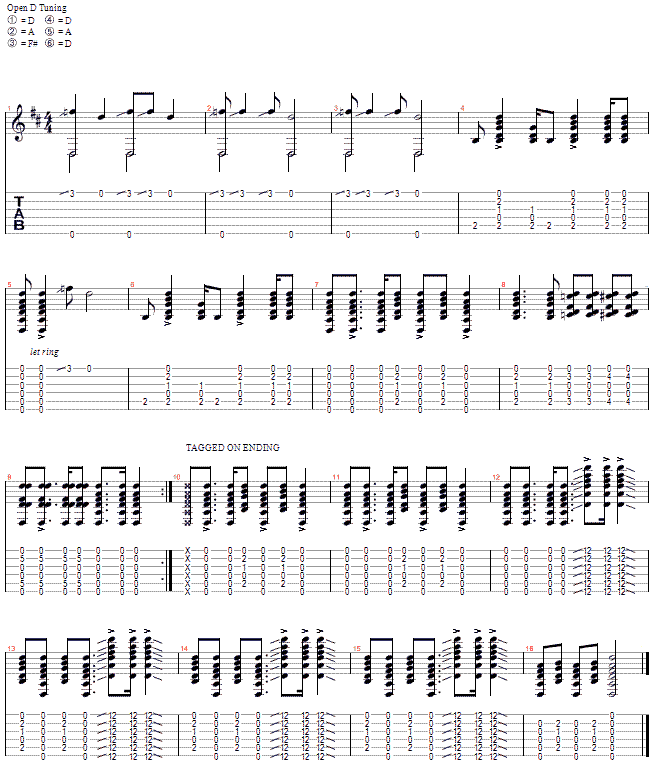 The song part is 9 bars long and in the video clip I have played this bit once and then tagged on an ending to demonstrate a jump between a rhythm figure and slide at the 12th fret. In the first 3 bars I am angling the slide to get the melody on the top string [ using my R/H 1st finger ] and using my R/H thumb to hit some bottom D notes or the open chord — the rest is all strummed. In bar 8 I start with the chord shape [ G/B ] then remove the first finger as I go up the neck one fret at a time — these are octaves moving over the open chord.